MR1. ESGE recommends immediate assessment of hemodynamic status in patients who present with acute upper gastrointestinal hemorrhage (UGIH), with prompt intravascular volume replacement initially using crystalloid fluids if hemodynamic instability exists (strong recommendation, moderate quality evidence). MR2. ESGE recommendsa restrictive red blood cell transfusion strategy that aims for a target hemoglobin between 7g/dL and 9g/dL. A higher target hemoglobin should be considered in patients with significant co-morbidity (e. g., ischemic cardiovascular disease) (strong recommendation, moderate quality evidence). MR3. ESGE recommends the use of the Glasgow- Blatchford Score (GBS) for pre-endoscopy risk stratification. Outpatients determined to be at very lowrisk, based upon a GBS score of 0–1, do not require early endoscopy nor hospital admission. Discharged patients should be informed of the risk of recurrent bleeding and be advised to maintain contact with the discharging hospital (strong recommendation, moderate quality evidence). MR4. ESGE recommendsinitiating high dose intravenous proton pump inhibitors (PPI), intravenous bolus followed by continuous infusion (80mg then 8mg/hour), in patients presenting with acute UGIH awaiting upper endoscopy. However, PPI infusion should not delay the performance of early endoscopy (strong recommendation, high quality evidence). MR5. ESGE does not recommendthe routine use of nasogastric or orogastric aspiration/lavage in patients presenting with acute UGIH (strong recommendation, moderate quality evidence). MR6. ESGE recommends intravenous erythromycin (single dose, 250mg given 30–120 minutes prior to upper gastrointestinal [GI] endoscopy) in patients with clinically severe or ongoing active UGIH. In selected patients, pre-endoscopic infusion of erythromycin significantly improves endoscopic visualization, reduces the need for secondlook endoscopy, decreases the number of units of blood transfused, and reduces duration of hospital stay (strong recommendation, high quality evidence). MR7. Following hemodynamic resuscitation, ESGE recommends early (≤24 hours) upper GI endoscopy. Very early (<12 hours) upper GI endoscopy may be considered in patients with high risk clinical features, namely: hemodynamic instability (tachycardia, hypotension) that persists despite ongoing attempts at volume resuscitation; in-hospital bloody emesis/nasogastric aspirate; or contraindication to the interruption of anticoagulation (strong recommendation, moderate quality evidence). MR8. ESGE recommends that peptic ulcers with spurting or oozing bleeding (Forrest classification Ia and Ib, respectively) or with a nonbleeding visible vessel (Forrest classification IIa) receive endoscopic hemostasis because these lesions are at high risk for persistent bleeding or rebleeding (strong recommendation, high quality evidence). MR9. ESGE recommends that peptic ulcers with an adherent clot (Forrest classification IIb) be considered for endoscopic clot removal. Once the clot is removed, any identified underlying active bleeding (Forrest classification Ia or Ib) or nonbleeding visible vessel (Forrest classification IIa) should receive endoscopic hemostasis (weak recommendation, moderate quality evidence). MR10. In patients with peptic ulcers having a flat pigmented spot (Forrest classification IIc) or clean base (Forrest classification III), ESGE does not recommend endoscopic hemostasis as these stigmaSysta present a low risk of recurrent bleeding. In selected clinical settings, these patients may be discharged to home on standard PPI therapy, e. g., oral PPI once-daily (strong recommendation, moderate quality evidence). MR11. ESGE recommends that epinephrine injection therapy not be used as endoscopicmonotherapy. If used, it should be combined with a second endoscopic hemostasis modality (strong recommendation, high quality evidence). MR12. ESGE recommends PPI therapy for patients who receive endoscopic hemostasis and for patients with adherent clot not receiving endoscopic hemostasis. PPI therapy should be high dose and administered as an intravenous bolus followed by continuous infusion (80mg then 8mg/hour) for 72 hours post endoscopy (strong recommendation, high quality evidence). MR13. 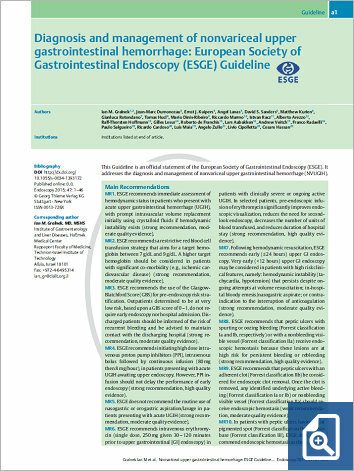 ESGE does not recommend routine second-look endoscopy as part of the management of nonvariceal upper gastrointestinal hemorrhage (NVUGIH). However, in patients with clinical evidence of rebleeding following successful initial endoscopic hemostasis, ESGE recommends repeat upper endoscopy with hemostahemostasis if indicated. In the case of failure of this second attempt at hemostasis, transcatheter angiographic embolization (TAE) or surgery should be considered (strong recommendation, high quality evidence). MR14. In patients withNVUGIH secondary to peptic ulcer, ESGE recommends investigating for the presence of Helicobacter pylori in the acute setting with initiation of appropriate antibiotic therapy when H. pylori is detected. Re-testing for H. pylori should be performed in those patients with a negative test in the acute setting. Documentation of successful H. pylori eradication is recommended (strong recommendation, high quality evidence). MR15. In patients receiving lowdose aspirin for secondary cardiovascular prophylaxis who develop peptic ulcer bleeding, ESGE recommends aspirin be resumed immediately following index endoscopy if the risk of rebleeding is low(e. g., FIIc, FIII). In patients with high risk peptic ulcer (FIa, FIb, FIIa, FIIb), early reintroduction of aspirin by day 3 after index endoscopy is recommended, provided that adequate hemostasis has been established (strong recommendation, moderate quality evidence).